Eastern Himalayan Summer Holidays Package India - Highest Motorable Mountain passes destination in India – Oldest Monasteries land in Sikkim India. If you want to explore the hidden beauty of the beautiful Eastern Himalayan of India then you are on right place. Holiday Travel India offers our best collection of destinations and their attractions which are beautifully arranged in this tour. Through this tour package you will get a chance to visit most beautiful towns of Sikkim and West Bengal which includes Gangtok, Kalimpong and Pelling with their famous excursion and activities. This trip will cover each and every sightseeing of mention destination in 6N/7D. So don’t waste your time and just go ahead to enjoy breathtaking holiday with us at best deals. What is Unique in Eastern Himalayan Summer Holidays Package India and why? Eastern Himalayan Summer Holidays Package India is unique because we combine most visited destination of Sikkim and West Bengal together. According to this package we are providing chance to visit at Buddhist Monasteries of Sikkim, Yak Safari at Tsongmo Lake, Paragliding in Gangtok, to know West Bengal Culture with Sikkim Lifestyle. Arrange well ranked accommodation in every destination. We boast of the best service quality of our tours & packages. After breakfasts check out from hotel and proceed towards Gangtok, it is the capital of Sikkim situated at 5,800 ft is undoubtedly one of the most often visited destinations in northeast India. Upon arrival check in to hotel and freshen up, after that you will be taken towards Ganesh Tok View Point, Tashi View. Then you may stop for lunch at any nearest restaurant, later continue your tour towards Hanuman Tok, Tsomgo Lake and Saramsa Garden. By the evening you will return back to Gangtok hotel and overnight stay with dinner at Gangtok hotel. Provides Chinese, Asian, Tibetan, Vegetarian Friendly. recreational activities like fishing. Spend some memorable moments with your loved ones here. A perfect place to take pictures, these waterfalls can be seen on the way to Khechopalri and Yuksam, near Darap Village. Sewaro Rock Garden: Sewaro rock garden is situated not far away from Karchen Power House. It is located around 12 kms from Pelling. This man-made structure by the Sikkim Government is a quiet and less frequented place, making it the perfect place for a picnic. It is on the way to Khecheopalri and Yuksam. The main attraction of the park is the water falls, Hydel station and the nearby villages. Waterfalls is spectacular in all season like summer, winter, autumn and spring except monsoon when though it’s in full force yet risky. It attracts many tourist and locals alike from all over the globe. Singshore Bridge: The Singshore Bridge in Pelling is considered as the highest bridge in Sikkim and the second highest suspended bridge in Asia. The Singshore Bridge acts as a connecting point between 2 hills, length of the bridge is 198 m, and the depth is 220 m. The downward view from the bridge is overwhelming with the sight of beautiful waterfalls and breathtaking views of the green hillsides above are pleasing. The Bridge is located at a distance of 25 Kms from Pemayangtse Monastery. Khecheopalri Lake: Khecheopalri Lake, originally known as Kha-Chot-Palri (meaning the heaven of Padmasambhava), is a lake located near Khecheopalri village, 147 kilometres (91 mi) west of Gangtok in the West Sikkim district of the Northeastern Indian state of Sikkim. Khecheopalri Lake is situated in the north-west direction of Pelling and is considered as a holy lake by Buddhists as well as Hindus. It is very popular by many names like Kha-Chot-Palri, Wishing Lake and Sho Dzo Sho. Changey Waterfall: Changey Waterfall is a splendid place to visit. It is located on the western slope of Pelling district of Western Sikkim and at a height of 300 meters. It is also known as Seven Sisters Waterfall dotted with eye-catching surroundings and serene ambience, the falls cast a magical charm on the mind of the visitors. While seeing the milky white water of the fall leaping out of the hillside and gushing down the deep valley with a roaring sound is something to be captured in the memories for long. Sangachoeling Monastery: Sangachoeling Monastery is an awesome place to visit and stands for second oldest monastery of Sikkim, located at a distance of 2km from the Pelling district of Sikkim. The Sangachoeling Monastery is built in a Tibetan style of architecture, and houses a sacred three centuries old Buddhist crematorium named Dhuthoe Silwar Tshar. he monastery houses, beautiful statues of Sakyamuni, Vajrasattava and Guru Padmasambhava and the wall paintings of various Buddhist gods. The best season to visit Pelling is winter season and the onset of summers. The favorable months to visit the place are between Septembers to May. This is the time when the tourists flock the place in large numbers. Tsomgo Lake / Gangtok Changu Lake: The glacial Tsomgo Lake is located at an altitude of 3,780 meters above sea level. It is also called as Changu Lake and is crossed by the Nathu la Pass on the north. This is one of the few and awesome high altitude lakes in India. The lake becomes doubly attractive with the reflections of the surrounding hills on the water. Tsomgo Lake is oval in shape and approximately 1km. long. It has an average depth of about 50 ft. it was created by the snow melted water from the mountains around the lake & a river namely Lungtze Chu has been created from Tsomgo Lake. The lake further falls into Rangpo-chu. Saramsa Garden: Saramsa Garden was established in 1922 and has served various purposes. This is a vast stretch of landscaped garden located about 14kms from Gangtok Town and near Ranipool. It's ideal for leisure and picnic. The purpose behind setting up of the garden was to cater to the needs of the British officers as well as the former Namgyal Royal family. Various fruit trees such as banana, orange, pineapple and guava were grown here. The Forest Department introduced Cephaelis Ipecacuanha, a medicinal plant in the year 1940. Ganesh Tok View Point: Ganesh Tok is a small temple dedicated to Lord Ganesh, it is so small that only one person can crawl into the temple at a time. However, the main thing to be notices here is its unique location which acts like a viewpoint. The view point is set at a height of 6500 m and offers spectacular sights of the snow capped peaks. There is a small temple dedicated to Lord Ganesha at the view point. The temple is so small that it can accommodate just one person at a time. Tashi View Point: Tashi View Point is one of the major attractions of Gangtok and is located at a distance of 8 km from the town. The place is a must visit for nature lovers as it offers great views of the imposing Himalayan mountains, specifically Mount Kanchenjunga and Siniolchu. This is basically a sunrise point to watch the majestic panorama of Mt. Kanchenjunga and Mt. Siniolchu with other snow clad peaks and can have an experience of the change of colour of snow on the mountains during the Sunrise. A resting shed and a small cafeteria situated at Tashi View Point provides shelter and other amenities to the tourists. A park above the View Point is a good place to enjoy a picnic. Shingba Rhododendron Sanctuary: Shingba Rhododendron Sanctuary is a nature park in the Indian state of Sikkim. It has forty species of rhododendron trees. It is located in the Yumthang Valley north of Lachung in North Sikkim district. Bird species found in the park include Wood snipe and Hoary-throated barwing. Vast range of flora is found at the place which includes Poppies, Rhododendrons, Primulas, Saxifrages, Gentians, Iris and much more. It is the home of spotted lingsang and tiger. Hanuman Tok: Hanuman Tok is a temple dedicated to Lord Hanuman. The temple is surrounded by lush green parks and beautiful mountains. From the temple one gets unobstructed views of Kanchenjunga. The word “Tok” in local language means temple. Hanuman Tok is a famous temple in Gangtok dedicated to Lord Hanuman. The legend about the place suggests that Lord Hanuman halted for a rest here while carrying Sanjeevni to Lanka from the Himalayas. Tourists and pilgrims gather at the temple in large numbers to pray and wish fulfillment. The idol of Lord Hanuman was erected here in 1950 when an officer named Appaji Pant had a divine dream at this location. 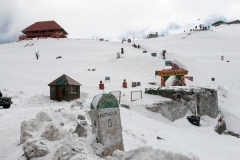 Nathula Pass: The mighty mountain pass of Nathu La is located at an astonishing height of approximately 4,310 meters above sea level and is considered to be one of the highest motor able mountain passes in the world. It is 56 km East of Gangtok and connects the Indian state of Sikkim to Tibet Autonomous Region in China. Nathu means "listening ears" and La means "pass" in Tibetan. This pass has historical importance and in 1904, Major Francis Young husband, serving as the British Commissioner to Tibet, led a successful mission through Nathu La to capture Lhasa. It is guarded on both sides by the Chinese and Indian soldiers. Gangtok is the best place for shoppers and this is the best places to pick up famous traditional things of Sikkim. Buying masks, footwear, carpets, handicrafts and other trinkets in the souvenir shops strewn along Mahatma Gandhi Marg. The main shopping areas in Gangtok are the Old market, New market and Lal market. Deolo Hill: Deolo Hill is one of the two hills that the town of Kalimpong stands between. Kalimpong is situated on a ridge connecting the two hills, Durpin and Deolo. Three water reservoirs, two of which serve as the primary drinking water source to the town are present atop this hill. The town of Kalimpong, the surrounding villages of Relli valley, Teesta River and its valleys all can be viewed from this point. River Teesta and the beautiful Relli Valley. If you arrive early in the morning sunrise views of Khangchendzonga from the park on the top of the hill are simply amazing. Jang Dog Palriffo Brang Gompa: The monastery serves as a sample of Buddhist construction style with beautiful paintings on the walls and the sacred Kunguyar serve as an important feature of this monastery. Thongsa Gompa: The oldest Bhutanese Monastery established in 1692, Thongsa Gompa, is also known as Bhutanese Monastery. The monastery is a perfect place for meditation. The temple which was structured directly under the call of Bhutan King was destroyed by the Gurkhas after their ravages in Sikkim during the arrival of British. The newly constructed monastery you will witness is a contribution of local people and Buddhist follower who had a clear vision to support the walls after an immediate destruction of it. Galingka: Galingka was constructed by the British wool traders who used it as a rest-house en-route their journey onwards. It is noted for its exquisite architectural style and is surrounded by a beautiful garden that is adorned with indigenous trees and flowering blossoms. Galingka offers spectacular views of the Kanchenjunga peak- the second highest Himalayan peaks. Though a yak rides slowly on the gentle and steep slopes, a ride from Gangtok to the enchanting Tsongmo Lake is an experience that outlooks any of the activities in the vicinity. Taking you through the curvy, rugged and challenging terrains of Gangtok, a Yak Safari allows you time to absorb the fascinating colours and true beauty of this region. You will get to ride the yak in Tsomgo Lake and in various trekking points like Dzongri in West Sikkim onwards Chopta Valley Jeep & Yak Safari Tour. This adventure sports is slowly becoming very common in India though its origin can be traced back to 1940s. If you want to get up close with nature, then paragliding can be a wonderful way to do so. Paragliding in Sikkim offers an experience that is worth cherishing for a lifetime. The total flying time in high fly is 20-30 minutes. Deolo Hill is one of the two hills that the town of Kalimpong stands between. Kalimpong is situated on a ridge connecting the two hills, Durpin and Deolo. The hill is located north east of the town. Three water reservoirs, two of which serve as the primary drinking water source to the town are present atop this hill. The town of Kalimpong, the surrounding villages of Relli valley, Teesta River and its valleys all can be viewed from this point. Ride through the mountains and witness the stunning geographical features of the region. Enjoy a delicious local Nepali meal before reaching Lava via Algara riding for about 32 kms. Gaze at the stars in the clear blue night sky while having a delightful camping experience camping. Indulge in this exciting biking tour and get a chance to explore the majestic beauty of this region while riding through the rough terrain. Reach Savoke after a riding a distance of 103 kms via Gorubathan and Damdim. Samco Ropeway is about 1.5 km long located over the two rivers, Teesta and Relli respectively. It had been built by Christian missionaries to assist the Lepcha people. Darjeeling ropeway stopped long ago and the government is planning more of its kind in this region. It takes the passenger to the highest point of the city of Gangtok covering the distance of about one kilometer in only seven minutes. Each cabin accommodates 24 passengers. This is an amazing experience of visiting several villages in virgin Kalimpong area located at the foothill of the Himalayas, get to understand the local culture & traditions of the villagers, experience authentic Nepali food. This is a chance to experience Himalayan village life with our guided tours for individuals or groups. We take small tour groups on a two day moderate trek between three small villages set in stunning scenery overlooking Sikkim and with Kanchenjunga never far from view. Lepcha museum is one of the prime attractions. This museum displays oodles of things related to the Lepcha culture, traditions and heritage and so, those who are great fond of such collections must visit the place for the sure. The museum displays various articles of worship, original Lepcha musical instruments, handicraft items and manuscripts. Every piece reflects and illustrates the life, culture and tradition of the community. The culture of West Bengal is an Indian Culture which has its roots in the Bengali literature, music, fine arts, drama and cinema. Chhau Dance is one of the most renowned tribal martial dances of India. The dance is known as Seraikella Chau in Jharkhand, Mayurbhanj Chau in Orissa and Purulia Chhau in West Bengal. Since the dance is supposed to have originated in the Purulia district of Bengal, it is known as such in the state. Most of the inhabited regions of Sikkim experience a temperate climate, with temperatures seldom exceeding 28 degree C in summer. The average annual temperature for most of Sikkim is around 18 degree C. Sikkim is one of the few states in India to receive regular snowfall. This festival is celebrated in the month of September-October. This pageant holds special significance for Both Hindus and Nepalis as it stands for the triumph of good over evil. The very next day, the statue of Goddess Durga is taken in a colourful procession for its immersion inside a lake or river. This marks the end of Dasain. A colorful pageant celebrated within the honour of Mount Khangchendzonga, the guardian deity of Sikkim and to Yabdu, the supreme commander. The Lepcha believe that the moutain will be the location of their origin. People visit the monasteries to provide worship. Butter lamps are also offered. The entire scene appears spectacular when the monks inside a huge procession take a look of the city carrying holy scriptures. A flower festival is organised every year in Gangtok. The flower festival starts with the Orchid Display in March during which competitions are organised in numerous sections. Exhibition Centre close to the White Hall Complex is well-liked with both vacationers as well as local people and draws in a sizable number of visitors every day.